By Becky JohnsonRapidly firing incomplete sentences on cell phones might not look or feel like the same Cherokee language spoken by fluent elders, but it’s a critical juncture in the race to pass the torch to the next generation of speakers. Putting the language at the fingertips of youth in a format they know means the language is being used in daily life and interactions — which is ultimately the test of a language’s survival. Cherokee language proponents have collaborated with Google to launch a Cherokee language interface and Cherokee language version of GMail. 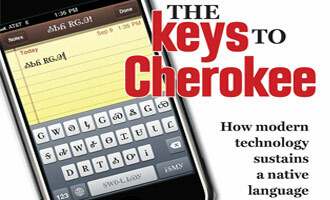 One click of the mouse can switch the language settings to Cherokee for web searches and composing email messages. The possibilities are vast. Whether it’s Cherokee YouTube videos or skyping with native Cherokee speakers, getting the language into new popular mediums could make the difference in the language surviving or dying down the road. By Jenny KaneKNDN radio, one of three Navajo language radio stations in the Southwest, serves listeners across the Navajo reservation, which spreads across three states: New Mexico, Arizona and Utah. KNDN has roughly 100,000 listeners on any given week. The listeners, for the most part, are among the more than 330,000 Navajo that live in and around the Navajo Nation. Since KNDN became a full-time Navajo language station in 1978, fans have tuned in, some without a break, to hear the news of the reservation. "They don't wait," Werito said, noting that he goes on air at 6 a.m. daily and immediately is flooded with calls. "A lot of our people listen. It's where they get their news." He announces coal allotments, hay and corn distributions, ceremonial events, school board meetings and items lost and found. By Dan GundersonMusic is a time honored part of worship in most religions. 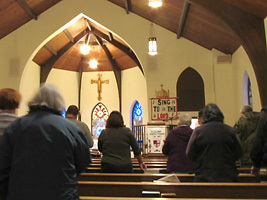 For many Ojibwe people in northern Minnesota, hymns are much more than an expression of religious devotion. They represent a unique piece of Ojibwe culture tribal that members are trying to preserve. White Earth Tribal Chair Erma Vizenor, one of the singers at the service, said it's critical to keep the Ojibwe language alive. "This is one way we can keep it," she said. "We can use it, we can share it, we can build community with it." Vizenor grew up with Ojibwe hymn singing and traditional spiritual practices. She remembers neighbors gathering in her grandparents' tiny two-room home to sing, and her grandparents explaining traditional ceremonies.